UPDATE: Read about and include Makerware helper disks in your design. These will improve print quality and reduce warped builds. Click here for the info on using helper disks. This design will create a home for your student SD card. Each person’s design will have a space in the classroom and will securely hold an SD card. Just as you are responsible for keeping track of your SD card your design must have the same goal. These SD card holders will be visible in the classroom and will get some attention from other students. Take this opportunity to create a design that will be unique and showcase your creativity. -design a backplate for your sd card holder that is 100mm wide by 130mm tall. Your design cannot protrude from the wall more than 80mm. -your design must include a mounting hole at the top of the design. The whole should be 5mm across. -design a space for the SD card. The SD card dimensions are: 31mm by 23.1mm by x by 2.14 mm. -create a design that is more than just a shelf or slot in a box. Consider hinged parts, doors, drawers, flaps. etc. Grab the classic paper and pencil. Start drawing ideas for your design. This brainstorming phase will help you to discover challenges and features of your design BEFORE you start building in 3d. The combination of shapes must be a critical part of your design. How will you use the shapes in tinkercad to build your design? Talk a partner through your design and incorporate any feedback or design changes. Then show me your paper design before you begin your work in Tinkercad. I will approve your design before you go to tinkercad. Begin building in tinkercad. 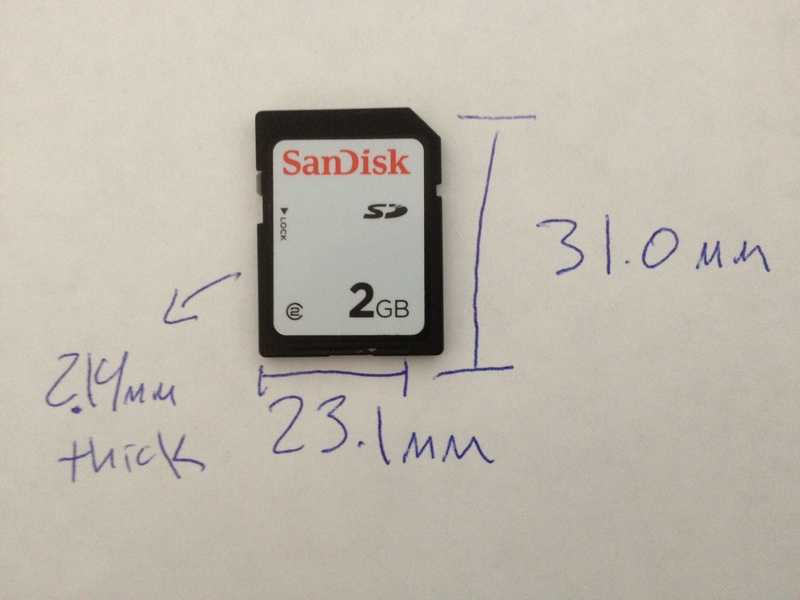 Keep in mind the overall design dimensions as well as the dimensions of the SD card.